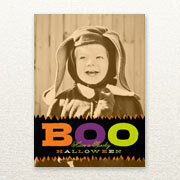 Give them a good scare with our adorable Halloween cards. Raise their spirits with fabulous Halloween invitations. 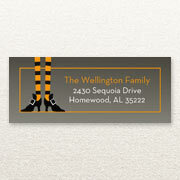 Give your envelope a treat: Halloween address labels. Whether Halloween makes you embrace your inner princess of ghostly ghoul, Halloween is for many the most wonderful time of the year. This fall, send out personalized greetings to your friends, family and loved ones. Shutterfly has everything you need to create custom Halloween stationery. Thanks to Shutterfly, it is easier than ever to turn your favorite pictures of your little goblins and spooky witches into adorable Halloween stationery. Simply upload your best images to Shutterfly and insert them into your favorite template. You can customize your stationery’s fonts, colors and message. The design assistant will walk you through the creation process and many of the Halloween card options can be printed on your choice of premium cardstock. Halloween cards make great notes to relatives just because, or can be used to invite all your friends and family to the best little haunted house on the block. Throwing a Halloween party is a great way to bring everyone together. Invite your favorite bunch over for pizza and spooky games. You can play classic games, like “Guess what gross thing you are touching.” Use cold spaghetti for brains, or peeled grapes for eyes. Pair everyone up and you can have everyone play mummy. Gather your surplus of toilet paper and see who can do the best job wrapping their partner up. For fun, after the mummy wrap you can have a mummy race. Be ready to have your camera ready for this one. Shutterfly is here to help you turn your favorite photographs from each season into beautiful greeting cards that will show your loved ones how much you care. Turn the adorable photos you took of the kids with Santa, or next to their snow fort, into personalized Christmas cards. Turn beautiful springtime photos into elegant Easter cards. Shutterfly is here to help turn your memories into thoughtful greetings. No matter what holiday you are celebrating, what season or whether you are simply saying hello or inviting loved ones over for a party, there is the perfect customizable stationery option. Halloween is a fun time to connect with friends and family and meet new neighbors. Custom Halloween stationery is a great way to reach out to friends and family right before autumn turns into winter and everyone’s life gets super busy. Shutterfly is here to help you make memorable Halloween cards. 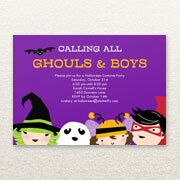 Invite all the ghouls and boys with this hauntingly good Halloween invitation. Just add all the spooktacular details.